Cabinet website design is also part of the solutions that we offer. the more granite companies that we work with the more partners also have a cabinet offering as well. We have been marketing cabinet sales and installation services for 4 years typically in conjunction with our granite partners. 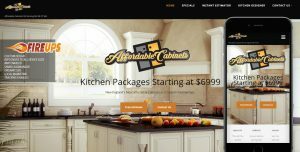 This solution enables you to promote your cabinet business under a co-brand just like our granitemakeover.com solution. Many installers find that they are able to build a direct marketing channel and sell from a position of knowledge. If you are an installer looking to branch out to direct sales contact us for more details. we will be happy to help position you for success. We know many of the pitfalls of working with cabinets and marketing them online. We find ways to focus on how we can differentiate you in the complicated market place. We help you set expectations and generate results in days, we have specific goals that are set and when reached ensure scale-able growth. cabinet Market Analysis & Competitive analysis? and more... We are your virtual marketing arm.